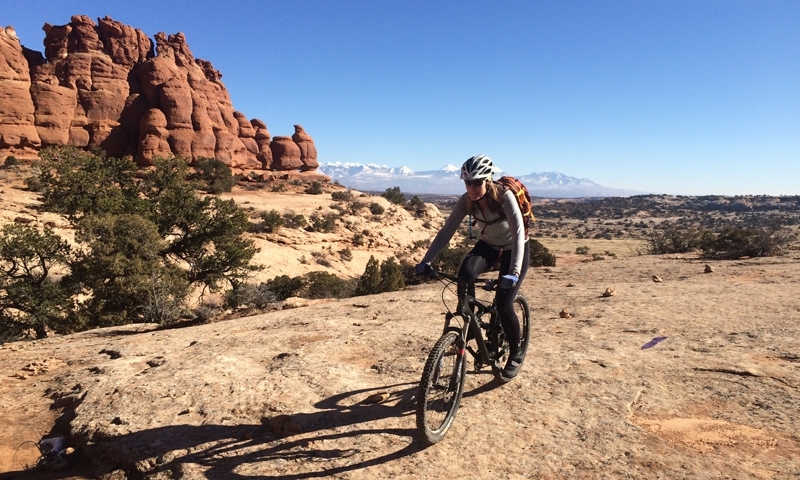 This relatively new trail system north of Moab offers a fun series of loops that can be ridden all at once or on their own. 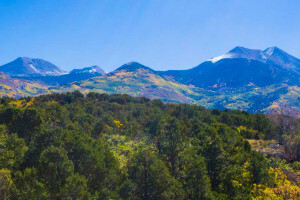 Rocky Tops, Coney Island, Big Lonely, Big Mesa, and Ramblin Trails form the entire loop. There is a lot of slickrock and also a lot of pedaling. Starting at the West Parking Area (see directions to the trailhead below), ride Big Mesa, Big Lonely, and Coney Island in a counter clockwise loop. Connect back with the road and ride Ramblin' and Rocky Tops as a clockwise loop. Overall, it's 18 miles in a figure 8 loop, but you can break off at pretty much any intersection and head back to the car. From the West Parking Area, ride up Ramblin/Big Mesa which share the first 1/4 mile of singletrack. Head left/west on Big Mesa for a scenic ride along sandstone cliffs. There is a lot of up and down along this slickrock trail, with a few tricky and sandy spots. Continue on to Big Lonely for more slickrock riding. At Coney Island you'll hit some dirt and sand for the first half, followed by fun downhill slickrock. Climb back up to Hwy 313 at the end of Coney Island to ride Ramblin and Rocky Tops in a clockwise loop. Start up Ramblin/Big Mesa again and then head east/right onto Ramblin. It's a fun combination of slickrock and dirt and mostly a downhill ride with a few climbs. Cross Hwy 313 and continue on to Rocky Tops. It's generally up, back to where you came from, but has some good flow and slickrock. Watch for a little sand. Distance: 18 mile loop which can be broken up into smaller chunks. Average Time: 2 to 4 hours. 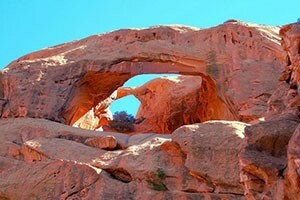 Trailhead: From Moab, drive north of town and follow signs to Dead Horse Point State Park (Hwy 313). At mile 6.4, turn right onto a dirt road and park. Ignore a wide ATV trail and take the singletrack just to the left of it.